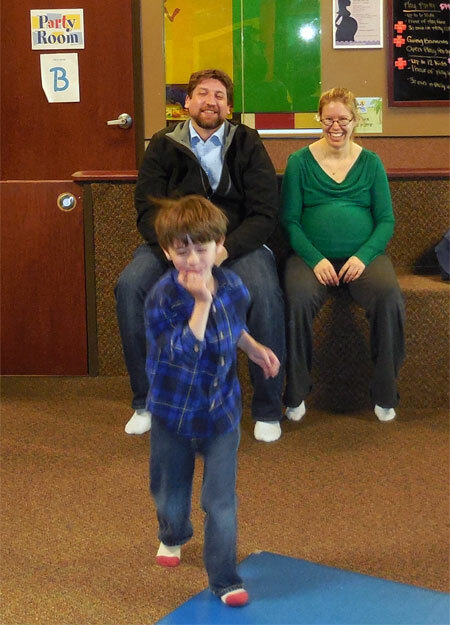 My lucky little boy got to celebrate his 5th birthday twice this year—once on his actual birthday, and again a month later. That was because a snowstorm in March interfered with our original plans for a birthday party at Little Monkey Bizness, and we ended up rescheduling it for mid-April after my classes ended for the spring. 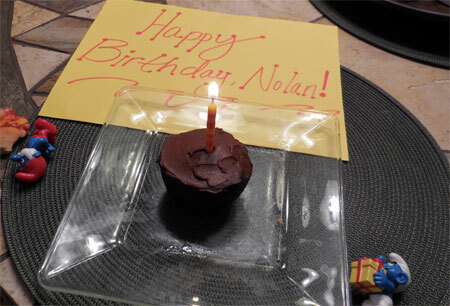 Even though we didn’t have a big party in March for his actual birthday, there still had to be cake, and where Nolan is concerned, chocolate is always the best option! I decided to make cupcakes to share with his preschool class, and tried my hardest to make them allergy-friendly because one of his friends has a pretty limited diet. Although I didn’t have a list of all her allergies, I did know she can’t do grains, dairy, soy, eggs, or nuts. I ended up making these vegan, grain-free chocolate chickpea cupcakes using homemade sunflower milk, flax eggs, and garbanzo bean flour, and topped them with chocolate avocado frosting. 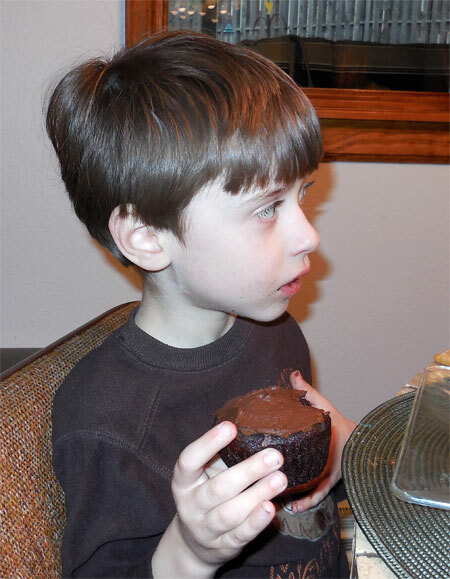 They look like regular chocolate cupcakes, taste great, and are full of protein, fiber, and healthy fats—kids and adults alike really enjoyed them, including the birthday boy. Unfortunately, Nolan’s little friend still couldn’t have a cupcake, as it turned out that she also can’t have legumes, sunflower seeds, or flax. But at least I gave it my best shot! Cut the avocado in half and remove the pit. Scoop out the flesh and put in a blender, or the bowl of a food processor. Add cocoa powder and the remaining ingredients. Process until smooth, occasionally scraping down sides. The chocolate chips can be omitted and/or more sunflower (or other non-dairy) milk added for a slightly looser consistency if you want to eat it as pudding; cocoa powder or maple syrup can be increased to adjust the flavor. Source: Adapted from Food Nouveau. Soak sunflower seeds in filtered water 8 hours or overnight; drain and rinse. Place in blender with a fresh 4 C filtered water, and blend on high speed for 3 minutes. Sweeteners or flavorings like maple syrup, dates (soak overnight with the seeds), or vanilla can be added if desired. When the snowstorm forced us to reschedule Nolan’s birthday party, we pushed it back a month so I would have a little more time to devote to party preparations. The party fell over lunchtime, so we went with a Mediterranean food theme: I made pitas, hummus, roasted and marinated vegetables, grilled chicken, and a farro salad with cucumber, tomato, and radish; Nolan likes my pitas with hummus and will eat some chicken most of the time, and we also provided some cold cuts, as well as peanut butter and homemade grape jelly for the picky eaters. Unfortunately, my own picky eater decided food was much less interesting than trying to get back out to the bouncy house, and rejected everything until we brought out the cupcakes. This time I didn’t have to worry about any allergens aside from Nolan’s dietary avoidance of dairy, but I still ended up selecting a gluten-free recipe: chocolate quinoa cupcakes, made from the whole cooked grain pureed in my Vitamix with cocoa powder, plenty of eggs, and almond milk. I topped them with fluffy, gooey marshmallow frosting (the same from his first birthday cake, incidentally) and some dairy-free mini chocolate chips. Everyone really enjoyed these, including birthday boy, who ended up smeared with frosting from head to toe. 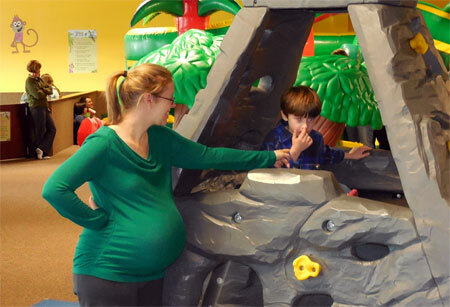 Unfortunately, by that point, the staff was politely trying to bustle us out of the room—half an hour is nowhere near long enough to feed preschoolers lunch and cake, special needs or no—so we all gobbled down our cupcakes with no photographic evidence. The amount of sugar listed here is slightly less than in the original recipe, and I would probably trim it down to a cup or even less next time, especially if I will be frosting them. The blended quinoa mixture got very thick in my Vitamix, like pudding. Bring the quinoa and water to a boil in a medium saucepan. Cover, reduce to a simmer and cook for 10 minutes. Turn off the heat, stir in the coconut oil, and leave the covered saucepan on the burner for another 10 minutes; uncover and allow the quinoa to cool somewhat before use. Preheat the oven to 350°F. Line cupcake tins with liners and set aside. Combine the almond milk, eggs and vanilla in a blender or food processor. Add the cooked quinoa and oil mixture, and blend until smooth. Whisk together the sugar, cocoa, baking powder, baking soda and salt in a medium bowl. Add the contents of the blender and mix well. Fill the cupcake pans 2/3 full. Bake for 15-18 minutes. Remove from oven, allow to cool in pans for about 5 minutes and then remove to cooling rack. 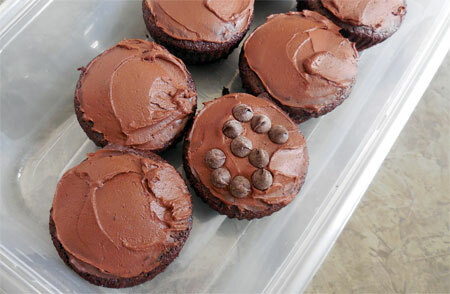 Allow cupcakes to cool completely and frost as desired. Source: Adapted from Cups by Kim.